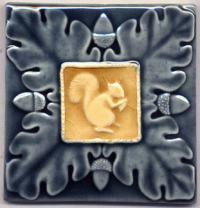 This charming handmade tile depicts a squirrel holding an acorn, surrounded by oak leaves and more acorns. The image is inspired from Victorian era tiles - the acorn design is actually a reproduction of a Trent Tile Co. design, the inlaid squirrel is an added detail. The squirrel section is glazed in goldenrod yellow (WA-5), the oak leaves are glazed in Perkins blue (WA-9). 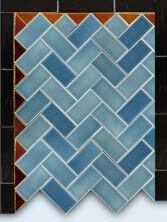 The glazes are transparent colors which flow from the raised pattern and pool deeper in the recessed areas. It measures approximately 3 7/8" square, varying slightly due to it's handmade nature. Available in all glaze types and colors. Please e-mail us with your glaze preference, if it's not shown.